There’s been a bit of rumbling lately about the new Tamron 70-200mm f/2.8 G2 zoom. Not just because it is a frontrunner in the 2017 Most Initials in the Name Award, but because a lot of people are saying it’s really quite good. The previous Tamron 70-200mm f/2.8 was a good lens, but since they only added two more characters to the name, I wasn’t sure this one would be hugely better; yet, people said it was. When you consider that it sells for a very reasonable $1,300 compared to $2,800 for the new Nikon 70-200 f/2.8 FL ED VR, $2,100 for the Nikon 70-200 f/2.8 VR II, and $1,900 for the Canon 70-200 f/2.8 IS II lens, well, it seems worth evaluating. So we decided to put ten copies on our optical bench and take a look, even though 70-200mm zooms are a pain to test. I should mention, just to avoid confusion, that this is the G2 Tamron SP 70-200 f/2.8 Di VC USD, not the slightly less expensive ‘not-G2’ Tamron SP 70-200 f/2.8 Di VC USD, nor the much less expensive Tamron 70-200 f/2.8 Di LD (IF) Macro lens. Keeping up with Tamron 70-200mm lenses is only slightly less complicated than keeping up with Nikon APS-C camera bodies. 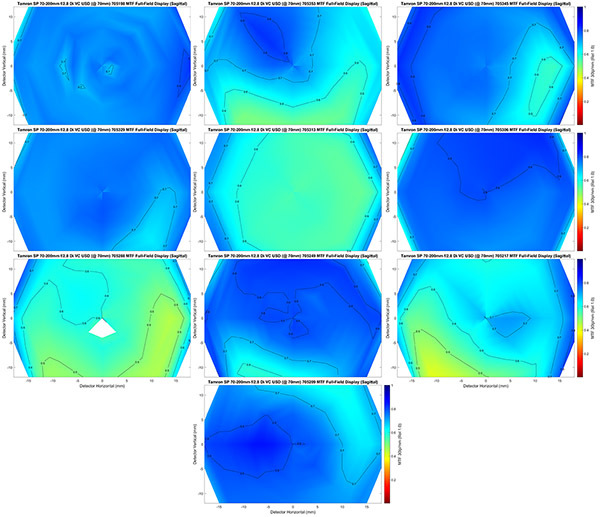 Well, as always, we’ll be showing you the MTF results obtained by averaging ten copies tested on our optical bench. To give you some idea of copy-to-copy variation I’m also going to use the Full Frame MTF displays that we’ve talked about in this article and that one. Of course, if you are already planning your comments to show the tests are all invalid and your favorite brand is wayyyyy better than this, you probably should at least glance at those posts. I mean, you can’t claim the data is all wrong unless you at least understand the methodology. Oh, wait, of course you can. 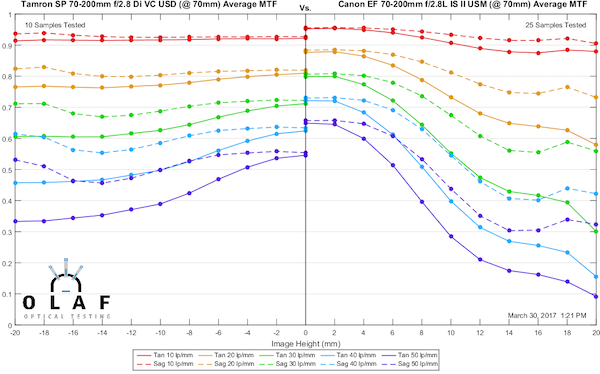 First, let’s look at the average MTF chart for the Tamron SP 70-200 f/2.8 yadda yadda G2 at 70mm, 135mm and 200mm. If you don’t speak MTF much, just remember higher is better, lines of the same color close together are better, and I’ll point out other little things as we go along. At 135mm the lens is actually resolving better than it did at 70mm. A fair number of 70-200 zooms are weakest here at the mid-range. There is less astigmatism at this focal length, too. Performance drops just a bit at 200mm, becoming similar to what we saw at 70mm, which is still quite good. You’ll notice at the center the sagittal and tangential curves aren’t together, which they should be in theory. That’s because our bench lines up with the geometric center of the lens. At 200mm and longer, sometimes the optical center is 1 or 2mm away from the geometric center. For those lenses, the ‘no astigmatism’ point is sort of a circle around the center. 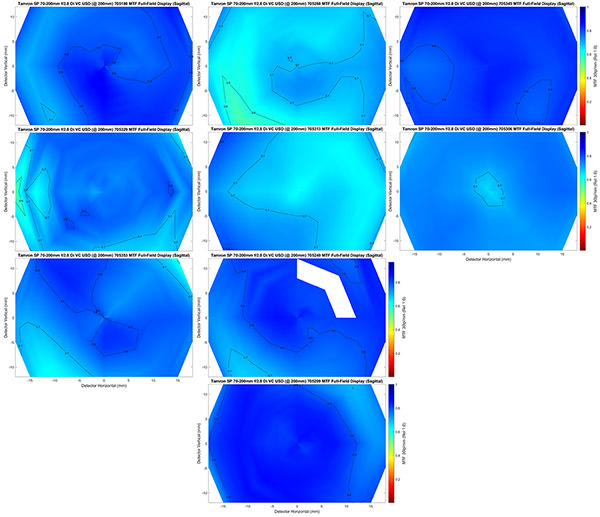 It would make no difference in a photograph, but it makes a slight difference in the tests. Overall, though, the Tamron puts in a very good performance. These are excellent MTF results. How About Some MTF Comparisons? That seems pretty reasonable. Since most people will be looking at this as an alternative to Canon and Nikon 70-200mm zooms, that seems the comparison to make. Let’s start by putting it up against the Canon 70-200 f/2.8 IS II, which is an excellent lens. 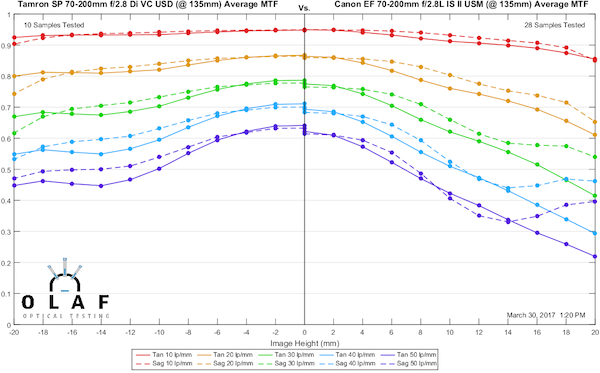 The Canon is clearly better in the center at 70mm, especially at higher frequencies (fine detail resolution). Away from the center and towards the edges, though, the Tamron catches the Canon and is better at the edge of the image field. At 135mm, where the Tamron is strongest, the two lenses are pretty even. The Tamron is a bit better at the edges, but otherwise, there’s little to separate them. The story is much the same at 200mm. From a pure MTF standard, the Tamron is as good in the center and perhaps a bit better at the edges. 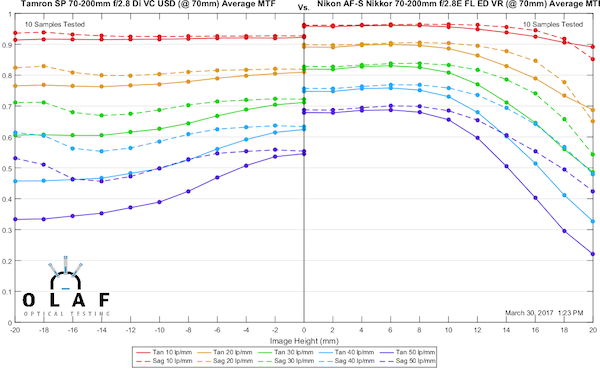 We need to provide a comparison for Nikon shooters, too, and unfortunately for the Tamron that means a comparison with the Nikon 70-200mm f/2.8 FL ED VR, which is currently the best 70-200 zoom on the planet. OK. The Nikon’s better at 70mm. What did you expect? And there’s a big difference at 135mm, too, particularly in the higher frequencies, although the Nikon does fall off at the edges enough for the Tamron to catch it there. 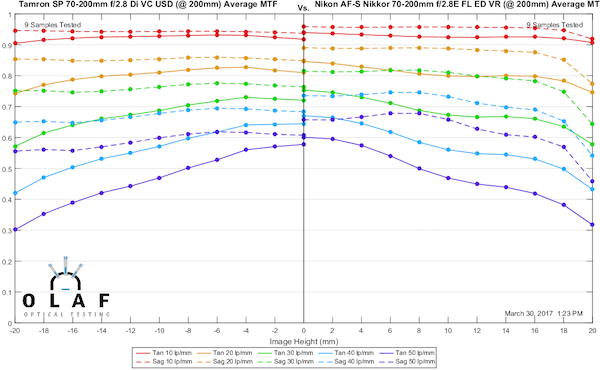 But let’s face it, most people are most interested in center sharpness at these longer focal lengths, and no zoom in this range is as sharp as this Nikon FL ED VR (including the VRII Nikon). At 200mm things are much more even. 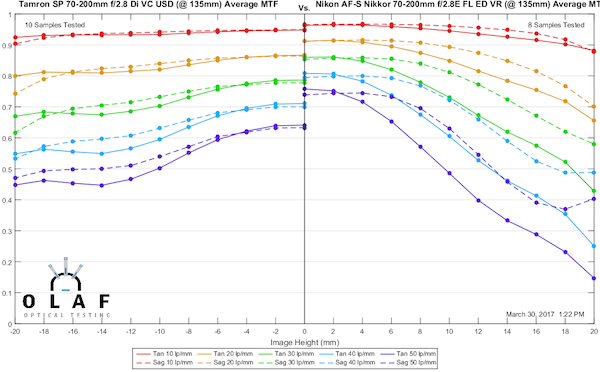 The Nikon is a tiny bit better, although the central false astigmatism of the test masks it somewhat. But it’s pretty close, it really is. Over the years we’ve tried to summarize variation a lot of different ways, none of which worked perfectly. So I’m just going to start showing you the actual tested copies with actual data so you can see how each varied. 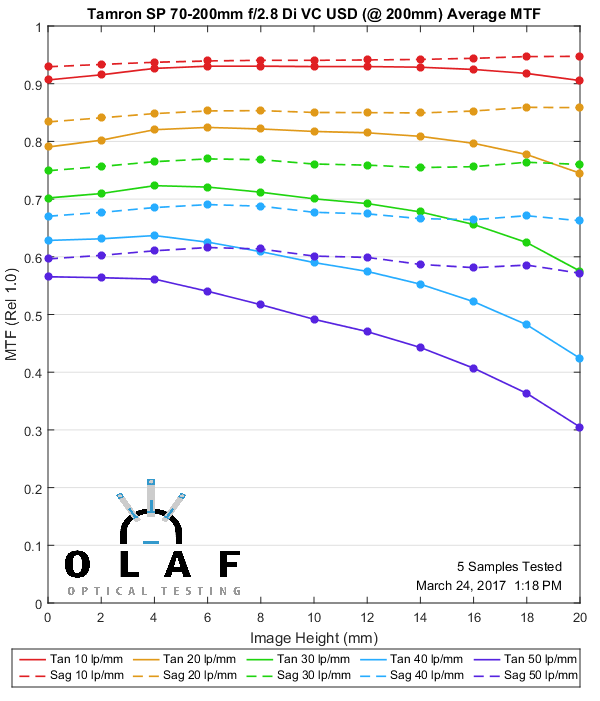 Here are thumbnails of the MTF full-frame displays at 70mm for all ten lenses (dark blue is best, green adequate, yellow-green getting noticeably soft). One thing to mention, this is actual data, and you’ll notice some white areas. This is where we removed data points, something we rarely have to do. This lens has a very easily moved vibration reduction element that does not lock down. 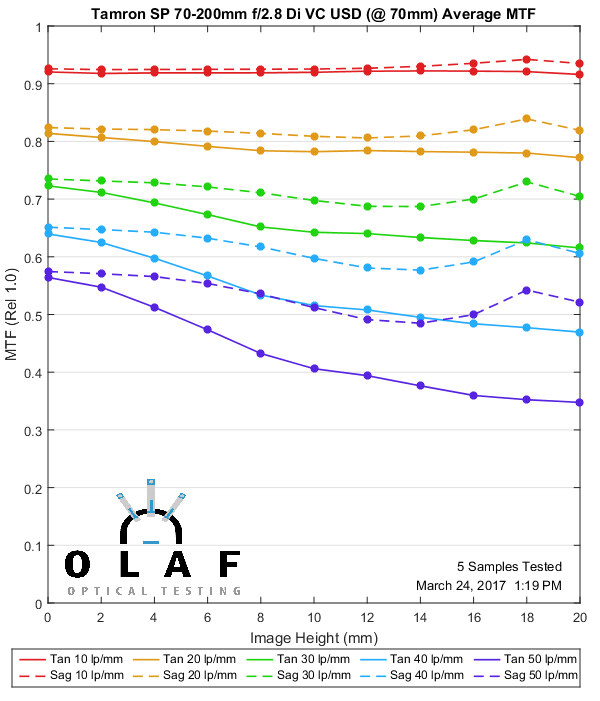 That has no effect when you’re taking a picture, but if the lens is on a very delicate optical bench and a truck drives by or someone drops a 50-pound box of supplies in the next room, the vibration showed up in the readings very obviously, so we deleted that data. We would usually have repeated the run, but in this case we were under time pressure to get these back in stock and I didn’t look at the data until after the testing was completed. 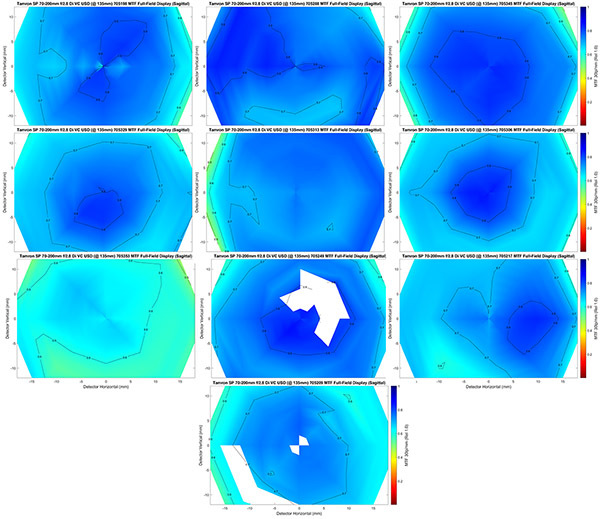 If you want my verbal summary, three copies are pixel peeping perfect (all blue), three are photography perfect (dark blue with some off-axis light blue), one (top middle) is adequate. Three have some issues at 70mm. They’re OK, but if you chart-tested carefully you could probably tell the three weren’t quite as good as the others. Before you scream ‘throw this one or that one out,’ let’s explain this a little further with a couple of important points. I’m showing you ten lenses right out of the box, as they ship and that’s what we do. Second, let’s look at them at other focal lengths because they’re zooms. And third, I’ll give you some comparison zooms in an addendum so you can see what 70-200mm zooms vary like in the best of circumstances. Then you can scream ‘throw them out’, just scream it about all zooms as I do. The same copies are in the same positions so you can look and see how they change at different focal lengths. Don’t try to kill yourself reading the shrunk down test run numbers in the thumbnails. Overall, you can see there’s less variation at 135mm with this lens, they’re almost all pretty good. That lower left one, that was weak at 70mm is still weak at 135mm, though. You get to see the more ugly underbelly of my testing life because my last testing copy was grabbed for rental before I could complete it’s testing at 200mm, so we only have nine results here. Other than the gap, they are again in the same location by copy. This is not what usually happens when we test, but usually, we have at least many dozen copies and getting them for testing is not a strain. With this lens, we have less than two dozen right now, and they’re in and out of stock pretty quickly. If nothing else, this should give you some understanding about why I roll my eyes when someone says they want a perfect copy of a zoom. 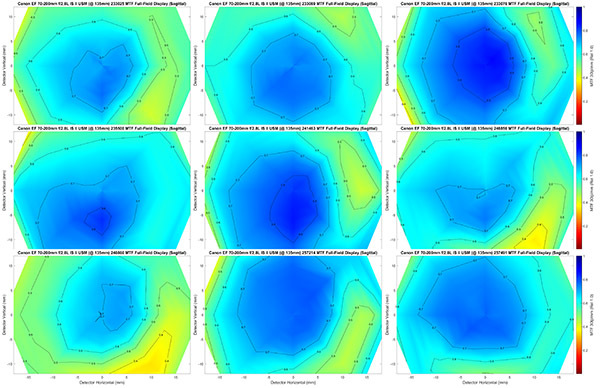 By my reading, there’s one of these nine that is excellent at all focal lengths. It’s the nature of zooms. 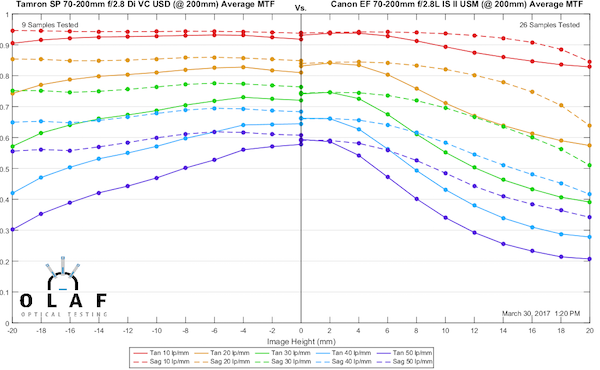 But the good news, since most people shoot 70-200mm lenses at the longer range, is that at the majority are good at the long end, in fact the variation is quite low. And for those of you who want to make rash statements about what you expect of your zoom lens (and remember, expectations are a down payment on disappointment) take a glance at the addendum where I’ve put similar charts for a very, very good lens; the Canon 70-200 f/2.8 IS II. And for you fanboys, no the Nikon and Sony 70-200s aren’t better than the Canon. Zooms are zooms, not matter how much you want to bang your fist on the table and demand that they shouldn’t be. 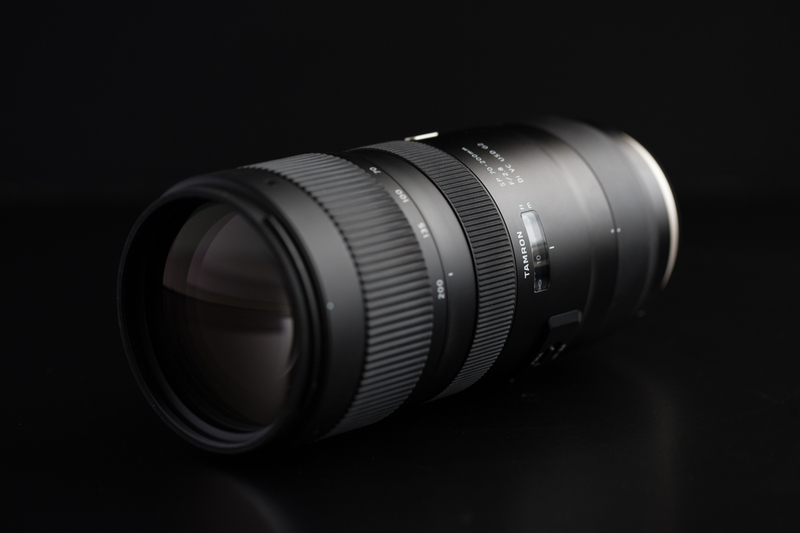 That if you’re looking for a 70-200mm zoom and the Nikon or Canon offerings are a bit too pricey, the Tamron 70-200mm f/2.8 G2 is worth looking into. From an MTF standpoint, it’s about as good as the Canon 70-200mm f/2.8 IS II, which means it’s as good as the Nikon 70-200mm f/2.8 VR II. It’s not as good as the Nikon 70-200mm f/2.8 FL ED VR, but then again, nothing is. And the price difference could buy you a nice second lens. As always, I’ll repeat, the MTF results make it worth a look. 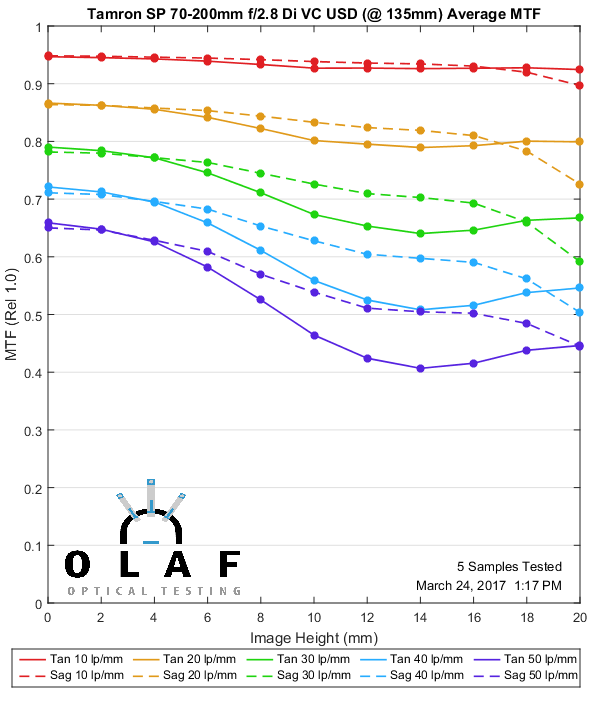 I’m not a lens reviewer, and many things like handling, color, flare, autofocus speed, and accuracy are going to matter as much or more as MTF results. But there are plenty of lens reviewers who will tell you that stuff. 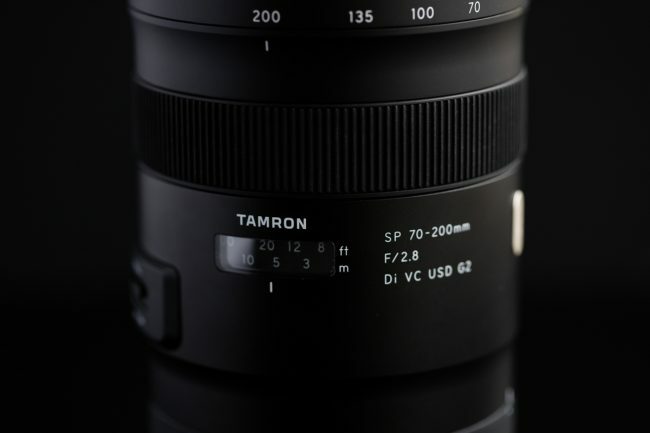 But as far as optical resolution goes, the Tamron is excellent at a really excellent price. I just put this here, so you have a comparison. 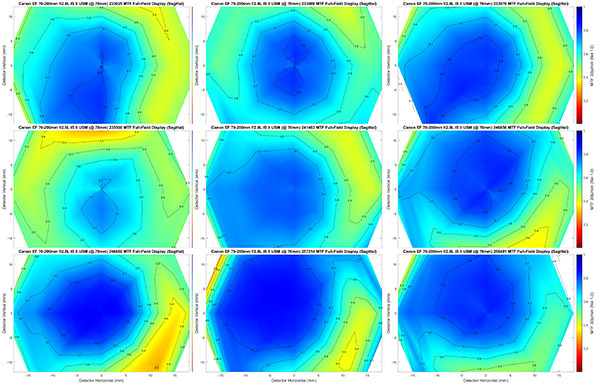 Again, each copy is in the same position in the graph for each focal length, so the top left corner is one lens, etc. 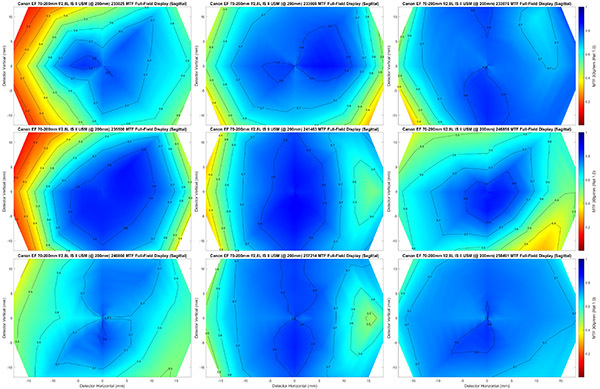 I just used thumbnails of 9 randomly selected copies because nine fits in the images better. I’ve got dozens and dozens, and these are good representatives. And if I replaced them with similar ones from other 70-200 zooms, it would look about the same. But making these takes time and time isn’t something I have enough of. But if you notice one that’s perfect at every focal length, feel free to point it out. That concern is mitigated by the ability to update firmware on the Tamron.